If you ask Tim and Sandra Fisher what’s in their blood, their answer is simple: farming. Both come from a long line of farming families: Tim (Class of ’93) is a sixth generation farmer, while Sandra (Class of ’94 and ’97) is a fifth generation farmer on her side. The duo are well-known on the Maritime agricultural scene both for their successful beef farm in Middle Stewiacke, NS, as well as their agricultural consulting and crop input business in Onslow: the Truro Agromart. Tim and Sandra started farming together in 1996, shortly after graduating from NSAC. Originally, they ran a Black Angus beef cow calf operation of over 100 head, but have since cut the herd down to 25. By decreasing required pasture area for their cattle, they were able to increase their crop acreage. Along with their beef cattle, Tim and Sandra and their children currently farm approximately 750 acres of corn, soybeans, barley and wheat. 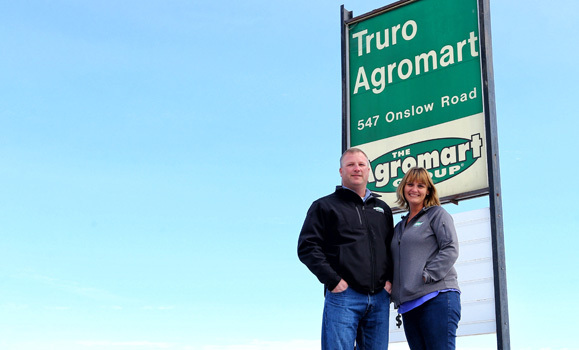 In 2004, Tim and Sandra had the opportunity to take over ownership of the Truro Agromart. Their lives haven’t been the same since. Truro Agromart Ltd. is a member of the Agromart Group, meaning the Agronomy Company of Canada is a 50 per cent owner. The other 50 per cent of shares are owned by local individuals in the agricultural retail area. This formula combines the strength of a large organization with local entrepreneurship and innovation and provides personal, specialized service to customers. 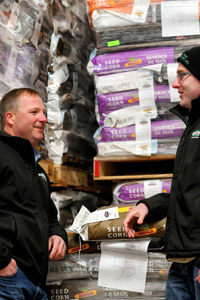 As manager of the Agromart, Tim oversees all operations at the fertilizer plant. However, agronomy is his true passion, so he makes a point of working with farmers on a personal basis. He enjoys doing farm visits and helping farmers grow successful crops. Agromart products come from around the world, meaning Tim has had the opportunity to travel near and far to meet with suppliers. This travel has exposed him to agriculture in other geographical areas, allowing him to bring knowledge and insight back to not only provide to his customers, but apply to his business. Sandra’s focus is on horticultural crops. After completing a Master’s degree researching strawberry diseases, Sandra started a strawberry consulting business. During her time as a consultant, Sandra scouted strawberry fields throughout northern Nova Scotia and southern New Brunswick. This provided her with the opportunity to get to know local farmers and see how everyday farming practices differ across operations. Tim and Sandra have had great success with the Truro Agromart. Since taking over ownership of the business in 2004, the Fishers have doubled its sales in the Maritime region. As dedicated farmers and business owners, they recently felt the need to reinvest in the Agromart and its facilities to meet the needs of agricultural producers in the area. So, in 2015, the Agromart underwent a major expansion. The original fertilizer plant, built in the 1960s, had been a part of many farmer’s lives for decades. As children, Tim and Sandra both remember their fathers getting fertilizer from the original plant, then under the CIL name. The old facility had a long history, but it was time for an update. 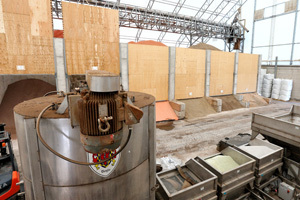 The expansion allows the Agromart to keep product year-round to meet the demands of multiple industries. As a locally owned operation, the Fishers are proud that the spin-off dollars from their new facility went back into the local community. 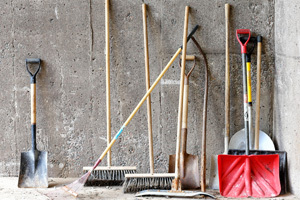 “All of our contractors were local businesses. In this economy, this is a big deal. The dollars spent here are staying here in this community,” Tim explains. With a new facility comes new product. Tim and Sandra believe it’s important to make all tools available to better help their clients succeed, be it new chemical, fertilizer products, seeds or advice. Sharing knowledge is just as important as providing the inputs themselves. “Being farmers ourselves, we try out products first to ensure that they in fact will provide better results for our growers,” says Sandra. When it comes to hiring staff, the Fishers look to employ individuals with various skill sets, but who have a strong agricultural background. “We’re always looking to hire people who are passionate about agriculture,” Tim explains. 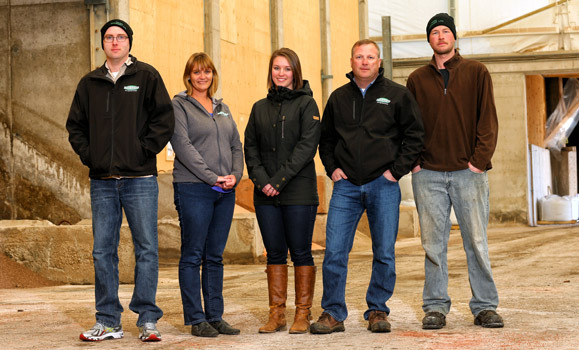 Of their 10 full-time employees, six are graduates of the Agricultural Campus; Sandra and Tim, Donnie MacGregor Class of (’01), Nicholas Juurlink (Class of ’07), Rebecca O’Connell (Class of ’14), and Darren Marlborough (Class of ’07). During the spring season, their numbers rise upwards of 30 employees. One day, that may include their two children, Luke and Abby. “Ask any local farm dealership owner, and they probably know Luke, as he does most of the equipment deals already. Luke is only in grade 10, but already plans on attending the Agricultural Campus for his degree. Abby’s only 11 years old and she already believes she will take over the Agromart. You just never know,” Sandra says. The Fishers are also passionate about giving back to the local community. The Truro Agromart supports numerous community groups, including local sports teams, church organizations, fire departments, school events, 4-H, and many more functions and organizations. Tim and Sandra feel a deep connection to their community and are proud to be both business owners and farmers in rural Nova Scotia. Recently, they purchased a piece of agricultural property in Upper Stewiacke. It wasn’t until the lawyer began tracing the original deeds that they discovered the land had first been owned and developed by Sandra’s great-great-grandfather. “It feels great that here we are decades later, farming land that has passed through many owners, but now is owned by us,” Sandra explains. “As farmers you have a connection with the land, you get to know each field. It is even more personal when you know that all of your ancestors farmed the same soil. Tim and I take pride in ensuring we are using the best agricultural practices to keep this land in top production, so our grandchildren can tell the same story."